Ah, what a foolish child I was. I totally took these things for granted because they were in my backyard and I could see them any time I wanted. Yesterday, watching the inaugural celebration on HBO from my living room in California, I fully appreciated the power and majestic presence of these landmarks and wished I was there. Though the skies were cloudy and the temperature frigid, the structures served as gleaming backdrops for the readings and songs presented by an all-star lineup. 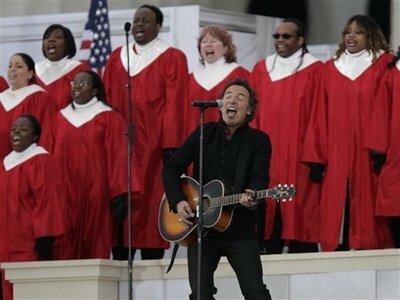 I loved how Bruce Springsteen walked out with just his acoustic guitar to do the first number. I wish they had let him do “The Rising” alone, though, because that song is more powerful stripped down. The choir almost overwhelmed it. Bettye LaVette dueting with Jon Bon Jovi on Sam Cooke’s “A Change Is Gonna Come.” You’d think WTH, right? It actually worked. Both were in fine voice and I couldn’t help but think, “Damn! Bon Jovi looks fiiiiine.” He’s a Clooney—someone who gets only sexier with age. Will.i.am channeling Bob Marley on “One Love” with help from Sheryl Crow and Herbie Hancock. Loved how the Black-Eyed Peas singer started out being faithful by sounding frighteningly like Marley but then worked in lyrics from his own group’s “Where is the Love?” and somehow made it all work. “Higher Ground,” but only when Stevie Wonder started singing. Usher began the song, then Shakira kicked in. Oooh, I love Shakira but this song was all wrong for her voice. As the two young hotties danced around the stage with Stevie on keyboards, I kept shouting at the TV, “Why won’t they let Stevie sing?! Don’t make him sit in the back of the stage!” But then Wonder picked up the song and everything was as it should be. Dude, he’s still got it. He showed the young ‘uns how it’s done. U2. I knew their song “Pride (In the Name of Love)” was inspired by Martin Luther King Jr. but when Samuel L. Jackson introduced them after talking about Rosa Parks and how Dr. King never got to see this day, the 24-year-old song took on new poignancy and made me cry. No one can sing like Bono, whom I think has the most searing voice in the business. Obama’s speech. What can I say? He’s an immensely talented speaker. He acknowledged how far down the crapper we are (when he mentioned people with stacks of bills on their kitchen tables, I said, “That’s me!) but at the same time made me feel extremely hopeful. The road to our country’s recovery will probably be long and hard like he said but I’m so glad he’s the guy leading us. The Boss and the plucky 89-year-old Pete Seeger (wearing only a flannel shirt in freezing temps!) leading a sing-a-long of “This Land is Your Land.” The camera showed George Lucas in the crowd heartily singing along. It was somehow heartening for me to see Lucas standing in the crowd like everyone else instead of sitting in some VIP seats for rich people. Of course, there were a few cheesy moments as well. When Tom Hanks read a portrait of President Abraham Lincoln, the brass band accompanying him was borderline obnoxious with its percussion accents and being so loud at times it seemed Hanks had to shout to be heard. And then there’s Garth Brooks. How come of all the stellar performers there, he was the one who got to sing three songs? Overall, though, the show was uplifting and ran quite smoothly considering the logistics involved. Let’s hope the same can be said about Obama’s administration. What were your favorite moments? Who did you think were the best performers and who had no business being there? I really liked the celebration, but I can’t help but wonder how much pressure it put on Obama. Only time will tell if it was cool to spend all that money at a time like this. Good music, for the most part anyway, but can somebody please tell me where all the miked chatter was coming from during the speeches? It was CRAZY LOUD!!! Good luck to the Prez! Thank GOD we finally got rid of the old one! The highlights for me were the Sheryl Crow/Herbie Hancock/Will.I.Am performance doing “One Love”; Garth Brooks’ medley (though he did screw up some lyrics on “American Pie” and “Shout” – How does someone screw up “Shout”? ); and I did like the Betty LaVette/Bon Jovi duet. Asian girl sleeping with her mouth wide open behind Obama was pretty funny.